I have recently received notification of the event detailed on the poster. Given good weather it sounds like it is well worth riding out to. 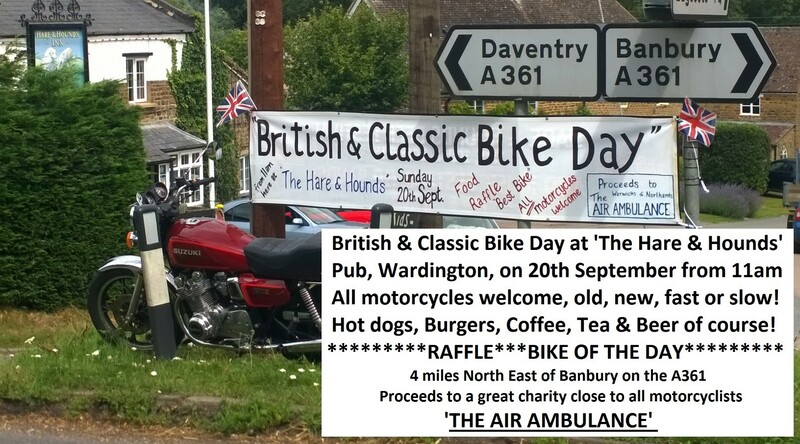 For the tea and coffee it’s just donations, there are reasonably priced burgers and hot dogs, a good raffle and all the proceeds apart from beer sales go to the Air Ambulance, also there is a Bike of the Day trophy. The Hare and Hounds is located (as stated in the poster) only a few miles NE of Banbury so this gives the oil a chance to get nicely warm but not too far for old knees. On Saturday September 12th the local branch of the Norton Owners Club organised the (now) annual Cafe Racer Day at The Vine in Cumnor. The event was well supported with riders travelling from wide and far and the selection of bikes in the car park was excellent. The Norton F1 Rotary racer was considered to be the best in show but many other worthy machines were commended. I suspect that the event will be held again next year at the same time and at the same venue, well worth a visit. A selection of the motorcycles that turned up are shown below.